"Mystery religions" redirects here. For mystery religions in Western culture, see western esotericism. The English word 'mystery' originally appeared as the plural Greek Mystêria, and developed into the Latin mysterium where the English term originates. The etymology of the Greek mystêrion is not entirely clear though scholars have traditionally thought it to have derived from the Greek myo, meaning "to close or shut" (chiefly referring to shutting the eyes, hence, one who shuts their eyes and is initiated into the mysteries). More recently, a number of Hittite scholars have suggested that the Greek term derives from the Hittite verb munnae, "to conceal, to hide, to shut out of sight". Mystery religions formed one of three types of Hellenistic religion, the others being the imperial cult, or the ethnic religion particular to a nation or state, and the philosophic religions such as Neoplatonism. This is also reflected in the tripartite division of "theology"—by Varro—into civil theology (concerning the state religion and its stabilizing effect on society), natural theology (philosophical speculation about the nature of the divine), and mythical theology (concerning myth and ritual). Mysteries thus supplement rather than compete with civil religion. An individual could easily observe the rites of the state religion, be an initiate in one or more mysteries, and at the same time adhere to a certain philosophical school. Many of the aspects of public religion such as sacrifices, ritual meals, and ritual purification were repeated within the mystery, but with the additional requirement that they take place in secrecy and be confined to a closed set of initiates. The mystery schools offered a niche for the preservation of ancient religious ritual. For this reason, what glimpses we do have of the older Greek mysteries have been understood as reflecting certain archaic aspects of common Indo-European religion, with parallels in Indo-Iranian religion. The mystery schools of Greco-Roman antiquity include the Eleusinian Mysteries, the Dionysian Mysteries, and the Orphic Mysteries. Some of the many divinities that the Romans nominally adopted from other cultures also came to be worshipped in Mysteries, for instance, Egyptian Isis, Persian Mithras from the Mithraic Mysteries, Thracian/Phrygian Sabazius, and Phrygian Cybele. The Eleusinian Mysteries were the earliest and most famous of the mystery cults and lasted for over a millennium. Whenever they first originated, by the end of the 5th century BC, they had been heavily influenced by Orphism, and in Late Antiquity, they had become allegorized. These mysteries were more concerned with prosperity than eschatalogy and hope in the afterlife, and so belief in an afterlife had always belonged to a minority and no person initiated into the mysteries made reference to it on their tombstones until the 2nd century BC. In the 15th of the month of Boedromion (September/October) in the Attic calendar, as many as 3,000 potential initiates would have gathered in the agora of Athens, the gathering limited to those that spoke Greek and had never killed (as the emphasis on purity grew, this ban would include those who had "impure" souls). Like other large festivals such as the Diasia and Thesmophoria, the prospective initiates would bring their own sacrificial animals and hear the festivals proclamation as it began. The next day, they would have gone to the sea and purified themselves and the animals. Three days of rest would pass until the 19th, the agora was once more filled with the initiates at the procession at the sanctuary of Demeter and her daughter Persephone. Two Eleusinian priestesses were at the front of the procession followed by many Greeks holding special items in preparation for the rest of the ceremony, and the procession would leave the city on an hours-long 15-mile journey constantly interrupted by celebration, dances, etc, to the city of Eleusis. The initiates would carry torches on the way to the city. Once the city was reached, the pilgrims would dance into the sanctuary. The next day would begin with sacrifices, and at sunset, the initiates would go to a building called the telestêrion where the actual initiations would commence. The initiates washed themselves to be pure and everyone sat in silence surrounded by the smell of extinguished torches. The initiation may have taken place over two nights. If so, the first night may have concerned the myths of the kidnapping of Persephone by Hades in the Homeric Hymn to Demeter (where Persephone is kidnapped and her mother, Demeter, searches the earth for her, and once her daughter was returned, Demeter promised prosperity in this life and the next) and ended with Persephone's return and the guarantee of fertility, whereas the second night concerned the epopteia (the higher degree of the Mysteries) which was a performance that included singing, dancing, potentially the showing of a phallus, a terrifying experience for the audience by the skilled Eleusinian clergy, and the climax of the event which must have included displaying a statue of Demeter and showing of an ear of wheat and a "birth" of agricultural wealth. Hence, these mysteries had associations with fertility and agriculture. 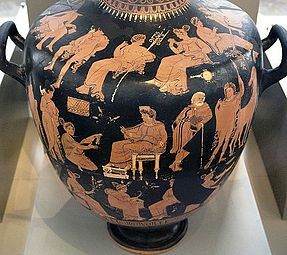 In an attempt to solve the mystery of how so many people over the span of two millennia could have consistently experienced revelatory states during the culminating ceremony of the Eleusinian Mysteries, numerous scholars have proposed that the power of the Eleusinian Mysteries came from the kykeon's functioning as an entheogen. The day of the completion of the initiation was called the Plemochoai (after a type of vessel used to conclude a libation), and the new members could now wear a myrtle wreath like the priests. Eventually, the initiates would leave and utter the phrases paks or konks, which referenced the proclamation of a conclusion of an event. The new members used their clothing in the journey as lucky blankets for children or perhaps were given to their sanctuary. The second most famous Mysteries were those on the island of Samothrace and promised safety to sailors from the perils of the sea, and most participants would come to be initiated from the neighboring regions. While the information here is even more scarce than that available with the Eleusinian Mysteries (and more late, dating to the Hellenistic and Roman periods), it's known that the Samothracian Mysteries significantly borrowed from the ones at Eleusis (including the word 'Mysteries'), furthermore, archaeological and linguistic data continues elucidating more of what happened at Samothrace. These rituals were also associated with others on neighboring island such as the mysteries of the deities of Cabeiri. Philip II of Macedon and his later wife Olympias were said to have met during the initiation ceremony at Samothrace. Heracles, Jason, Cadmus, Orpheus and the Dioscuri were all said to have been initiated here. The deities at Samothrace tended to be anonymously identified, being referred to as the "Samothracian gods", "gods of Samothrace","Great Gods", etc. This makes it difficult to reconstruct who they were, though they were often compared to the Cabeiri. There stand two statues of naked men in the Anaktoron of the Samothracians, with both hands stretched up toward heaven and their pudenda turned up, just as the statue of Hermes at Kyllene. The aforesaid statues are images of the primal man and of the regenerated, spiritual man who is in every respect consubstantial with that man. The scarcity of information precludes understanding what went on during the initiation, though there may have been dancing such as at Eleusis associated with the mythology of the search for Harmonia. At the end of the initiation, the initiates were given a purple fillet. There was also a second night of initiation, the epopteia where the "usual preliminary lustration rites and sacrifices" took place though not much else can be known besides that it may have been similar to the epopteia at Eleusis and would have climaxed with the showing of a great light. The initiation of the first night was concluded by banqueting together and many dining rooms have been uncovered by archaeologists in association with the cult at Samothrace. The bowls used for the libation were also left behind, revealed by the thousands of discovered libation bowls at the cult sites. The participants occasionally left behind other materials, such as lamps. In addition to the purple fillet, they also left with a 'Samothracian ring' (magnetic iron ring coated in gold) and some initiates would set up a record of their initiation in the stoa of the sanctuary. The initiation of the second night was also concluded by a banquet. Modern scholars reject simplistic notions of dependence of Christianity on the mystery religions. Towards the end of the 19th century and beginning of the 20th century, it was becoming more popular in German scholarship to connect the origins of Christianity with heavy influence from the mystery cults, if not labeling Christianity itself as a mystery cult. This trend was partly the result of the increasing growth of critical historical analysis of Christianity's history, as exemplified by David Strauss's Das Leben Jesu (1835-6) and the secularizing trend among scholars that sought to derive Christianity from its pagan surroundings. Scholars, for example, began attempting to derive Paul's theology from a Mithraic mystery cult in Tarsus, even though no mystery cult existed there nor did a Mithraic mystery cult exist before the end of the 1st century. The attitudes of scholars began to change as Egyptology continued emerging as a discipline and a seminal article published by Arthur Nock in 1952 that noted the near absence of mystery terminology in the New Testament. While some have tried to tie the origins of rites in Christianity such as baptism and the Eucharist to mystery religions, it has been demonstrated that the origins of baptism rather lie in Jewish purificatory ritual and that cult meals were so widespread in the ancient world that attempting to demonstrate their origins from any one source is arbitrary. Searches for Christianity deriving content from mystery religions has also been unsuccessful; many of them (such as the mysteries of Eleusis and Samothrace) had no content but rather limited themselves to showing objects in initiation. The studies of modern scholarship reveal that while Christianity was not a mystery religion, it was compared to them by various opponents of the early religion, such as Lucian and Celsus. Most early Christians, including Justin Martyr, launched attacks against the mysteries. Justin also compared Christianity to pagan religions, however scholars have criticized Justin for the shallowness of his comparisons. On the other hand, once Constantine became emperor of the Roman Empire and legalized the Christian religion, Christians lost their fear of pagan persecution and some concepts from the mystery religions, for the first time, became mainstream in Christian thought. ^ Crystal, David, ed. (1995), "Mystery Religions", Cambridge Encyclopedia of The English Language, Cambridge: Cambridge UP . ^ Barnes, Ernest William. The rise of Christianity. Longmans, Green and Company, 1947, 50-51. ^ Bromiley 1995, p. 451. ^ Puhvel 1984, pp. 188-192. ^ Johnson 2009, pp. 98-99. ^ Bremmer 2014, p. XI. ^ a b c d e Bremmer 2014, pp. 1-20. ^ Bremmer 2014, pp. 21-36. ^ (ed.) Patte, Daniel. The Cambridge Dictionary of Christianity. Cambridge University Press, 2010, 848-849. ^ a b Bremmer 2014, pp. 142-164. Bremmer, Jan (2014). Initiation into the Mysteries of the Ancient World. Walter de Gruyter. ISBN 9783110376999. Bromiley, Geoffrey (1995). The International Standard Bible Encyclopedia. Eerdmans. ISBN 9780802837851. Johnson, Sarah (2009). Ancient Religions. Harvard University Press. ISBN 9780674039186. Puhvel, Jaan (1984). The Hittite Etymological Dictionary. Walter de Gruyter. ISBN 9789027930491. Alvar, Jaime. Romanising Oriental Gods: Myth, Salvation, and Ethics in the Cults of Cybele, Isis, and Mithras (Leiden, 2008). Aneziri, Sophia. Die Vereine der Dionysischen Techniten im Kontext der hellenistischen Gesellschaft (Stuttgart, 2003). Bowden, Hugh. Mystery Cults of the Ancient World (Princeton, Princeton UP, 2010). Bremmer, Jan N. Initiation into the Mysteries of the Ancient World (Berlin, 2014). Casadio, Giovanni Casadio and Johnston, Patricia A. (eds), Mystic Cults in Magna Graecia (Austin, TX, University of Texas Press, 2009).